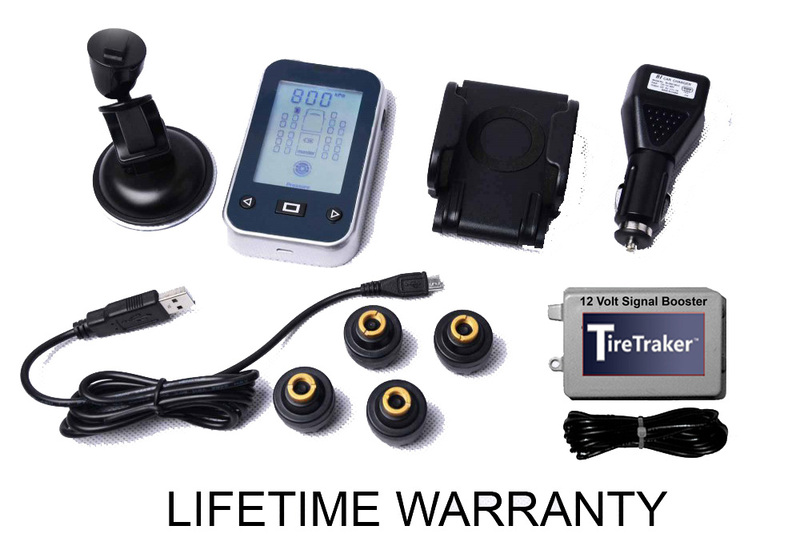 Our Premium TPMS with a 'Lifetime Warranty (Limited)'. This System features a larger, easier to read Monitor with LCD Screen. With an updated User Interface from our Basic TT-400 System, the TT-500 is much easier to program and simpler to use. The TT-500 will also measure pressures up to 232 psi and includes temperature monitoring as well. With the new 'Automatic Update Feature' the current pressures and temperatures will display on the screen with 10 minutes. Our TT-500 is the most innovative TPMS on the market today. We offer 7 day per week customer service and are the 1st and only company to offer a 'Lifetime Warranty (Limited)' on TPMS. The TT-500 consists of two basic components: Tire Sensors (Transmitters), which screw onto the wheel valve stems, and a Monitor (Receiver) located near the vehicle operator. Sensors transmit a coded RF signal and alert if pressure drops, pressure increases or temperature increases. The monitor displays each tire’s pressure and temperature per tire position and will display an audible and visual alert if pressure or temperature changes. All TireTraker TT-500 systems now include the new, high-power TT-200 Signal Booster at no additional charge (a $59 Value). A Signal Booster is an additional component that helps 'boost' the signal from the sensors to the Monitor. Because the sensors transmit the signals wirelessly at 433.92 Mhz, there can be many factors which can interfere with this signal. This interference is similar to interference you may experiencewith a Wifi signal - it may come and go. Copyright © 2004-2019 TireTraker™ TPMS All rights reserved.